The Community Foundation of NCW is now managing the NCW Foundation for Youth Grant, providing funds to support programs that directly benefit pre-K through 12th grade youth in Chelan and Douglas counties. Applications are now open, are accepted year-round, and awarded every other month. Up to $1,000 can be requested and funds must be expended within one year. Examples of previously funded programs include: Shop with a Cop, Beauty of Bronze, Girls on the Run, PTSA programs, after-school programs, and other activities that engage youth. The Community Foundation of NCW has distributed $53,125 to bridge the gap in funding for several United Way partner agencies that were anticipating support in 2018 from the United Way of Chelan-Douglas Counties. Thirteen nonprofit organizations were selected to receive funding based on being a United Way partner agency in 2017 that were likely to be funded in 2018. Each will receive the first-quarter amount they received in last year’s distribution from the United Way. Not all agencies that have applied for 2018 funding from United Way may be included in this distribution, as the United Way has not finalized those selections. “When United Way announced they were moving their fiscal year and delaying partner funding distributions, we knew we needed to help” said Beth Stipe, the foundation’s executive director. As a leading philanthropic resource to our region, the Community Foundation of NCW is committed to working with the United Way and its partner agencies throughout this transition. Registration is now open for the 10th Annual Nonprofit Practices Institute Summit, a day-long conference for nonprofit staff, board, volunteers, and anyone interested in learning about and fine-tuning best practices for nonprofit work. Registration deadline is May 7th or max capacity, whichever comes first. The Community Foundation of NCW is now accepting applications for a $50,000 Endowment Grant to support one nonprofit in Chelan, Douglas, or Okanogan county. An endowment fund at CFNCW provides a nonprofit agency an annual income disbursement to support its operations while the principal of the fund grows in perpetuity. The ideal grantee is a well-established, extraordinary organization making a significant impact on the community it serves. The organization must have experienced leadership at both the board and staff level who will use the $50,000 Endowment Grant to move the organization to the next level of expertise. Previous recipients include Methow Trails, Numerica Performing Arts Center, and the Children’s Home Society of Weantchee. The award will be announced and disbursed in September. 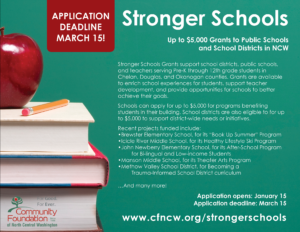 The Community Foundation of NCW is now accepting applications for its Stronger Schools grant program that supports public schools and school districts serving grades Pre-K through 12 in Chelan, Douglas, and Okanogan counties. Up to $5,000 is available for programs that enrich school experiences for students, support teacher development, and provide opportunities for schools to better achieve their goals. Applications can be submitted by teachers, PTSAs, staff, or supporting foundations. Only one application can be submitted per school with principal’s approval, but can include multiple projects. School districts are also eligible to apply for programs that will provide district-wide benefits or opportunities. School districts may apply in addition to schools within their district. Stronger Schools grant awards are disbursed in May and must be used within the 2018-2019 academic school year. Last year, the Community Foundation of NCW awarded $82,942 in Stronger Schools grants to twenty schools across the region, supporting literacy programs, music education, robotics, mentoring, and more. The Community Foundation of NCW is hosting a Strategic Planning in Nonprofits workshop on Tuesday March 27 at the Red Lion in Wenatchee and Wednesday March 28 at the Aero Methow in Twisp. Strategic planning offers a critical pathway for nonprofits to better achieve their mission. There are many benefits, including: increased focus, support, accountability, and ability to measure impact. Yet the vast majority of small nonprofits who do not have plans miss this opportunity to think deeply about their work and expand their capacity to deliver more powerfully on their mission. Strategic Planning in Nonprofits covers six planning elements: preparing, listening, envisioning, planning, executing, and evaluating. It anchors each unit in why they matter and provides tools to help learners act on what they learn and better achieve their mission. This workshop is designed for staff, board members, and others involved in the strategic planning process for nonprofit organizations. Both workshops begin at 9:00am and end at 3:00pm. Registration fee is $20 and includes light morning refreshments and lunch. The Community Foundation of NCW has awarded a total $441,630 to 25 nonprofits, thanks to generous donations to Give NCW from people across the region and beyond. The foundation awarded $201,250 in Regional Impact Grants, and the public donated $235,380 through Give NCW. An extra $5,000 was added to the total awards from the foundation through its Funday Monday contest, where names were drawn from donations processed on each Monday of the campaign. Winners received $500, $1,000, or $2,000 to use on Give NCW any way they chose. “This is the second year that the public has outdone the foundation in funding our local nonprofits” said Beth Stipe, executive director. “Give NCW allows everyone to be part of philanthropy. The minimum gift is $10, and those add up to a lot when everyone pitches in. We want everyone to feel like they can support good work happening in their own community, and these results make us feel we are helping to make that happen”, said Stipe. Give NCW is a crowdfunding campaign that supports twenty-five nonprofits who have received a Regional Impact Grant from the foundation to help fund a program or project, but still need additional funds to meet their goal. Donations to Give NCW are tax-deductible and credit card fees are absorbed by the foundation through the Partners in Giving program, so 100% of the donations support the nonprofits. Applicants must be 501c3 public charities or government agencies serving Chelan, Douglas, and Okanogan counties. The grant will be open June 1, 2018 and due August 1, 2018 – one month earlier than previous years. 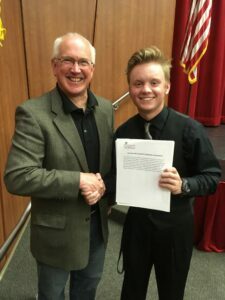 Steve Robinson presents the William and Elizabeth Robinson Scholarship, established in memory of his parents, to Hunter Brawley. Last year over a half million dollars in scholarships was awarded to 152 students in North Central Washington. The Community Foundation of NCW will open applications for its scholarship program on January 1, 2018. The deadline for most scholarships is March 1. The Community Foundation manages over 100 unique scholarships established by individuals and families who feel passionate about furthering education for local students. Scholarship criteria varies and many do not require top academics or participation in specific activities. In fact, most scholarships seek to support students who have served their communities, show growth and potential, and demonstrate significant financial need. Scholarships are available to high school seniors, current college students, and non-traditional students from North Central Washington who are planning to attend four-year colleges and universities, community colleges, and trade schools.